Penelope Crumb would LOVE Ramona Quimby And might even name her eyebrow "Marge." Penelope Crumb is no ordinary fourth grader. She carries around a red toolbox that used to belong to her father (who's been dead since Penelope was a baby), she keeps a list for the government chronicling the many ways in which her brother is turning into an alien, she helps her home-schooled neighbor Littie with her many projects--including the construction of a marshmallow helmet--and also, she can draw pretty much anything. So when her best friend Patsy has to draw a picture of Penelope for class, she attributes the big nose Patsy gives her to Patsy's poor art skills. But then Penelope finds out that it's true She "does" have a big nose Just like her Grandpa Felix, who's been gone from her life since before she can remember. What follows is a sweet and funny story--with tons of heart and hijinks-- about Penelope finding her grandpa and using her big nose--and his big nose--to make her family whole again. Fans of Clementine and Ramona will cheer as new friend Penelope finds what she is looking for. --"Kirkus Reviews"
Like such popular fourth-grade narrators as Amber Brown and Lucy Rose, Penelope Crumb has definite ideas and big dreams . 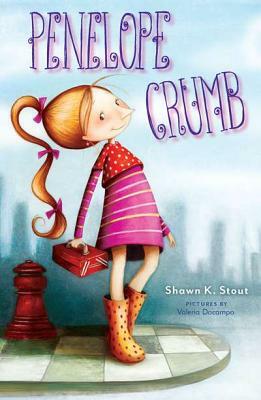 . . ultimately, Penelope's desires to connect with her relatives (even the 14-year-old brother who has changed so much she considers him an alien) bring the Crumb family together in a sweet and satisfying way. --"Booklist. Shawn K. Stout has held many jobs, including ice cream scooper, dog treat baker, magazine editor, waitress and, of course, author.She received her MFA in Writing for Children and Young Adults from the Vermont College of Fine Arts. Shawn now lives with her husband, her daughter Opal and her two dogs named Munch and Laverne in Frederick, Maryland, where she once won a ribbon for her Peach Pie at the Great Fredrick Fair.www.shawnkstout.com"